Now, we approach our new home: Aurora. Since the startling Mars trilogy, if not in advance of that, Kim Stanley Robinson has been seen as something of a standard-bearer for science fiction—and quite rightly. Again and again in the sixteen years since said series' completion, he's demonstrated himself capable of combining the very finest in futurism with the crucial components of sterling storytelling so many of his contemporaries unfortunately forget. Aurora chronicles Robinson's return to science fiction in the first, after the about-turn he took in 2013, but to begin with, it reads distressingly like a retread. Its premise depends upon a generation ship hurtling towards the Tau Ceti system, where the two thousand-some souls aboard plan to carve out a new home for humanity—a notion set in motion by the same sort of environmental catastrophe Aurora's author has explored before, not least in the Science in the Capital saga. After their arrival, these cosmic colonists take on the deceptively complex task of terraforming, much as the men and women of the Mars trilogy did. In the interim, they eke out a existence of subsistence in biomes rather reminiscent of those Robinson detailed in 2312—biomes which our central character slowly explores in the course of a long wanderjahr that isn't dissimilar to the walkabout Shaman started with. But readers? Read on. Because there's so much more to Aurora. In a sense, sure, it's a bit of a best of. But the best of Kim Stanley Robinson is arguably the best the genre has to offer, and beyond that, the passage of time and a pinch of patience exposes this thoughtful space opera's primary purpose: to chart the rise of an AI. Initially, the quantum computer in question spits out a wall of thinly-veiled data. Devi is accordingly disappointed; she wants Ship to write a novel, though she herself isn't sure how novels are written. Its second attempt is better, yet the result resembles a technical manual more than an actual narrative. To wit, Devi reminds Ship to describe the people inside it. What follows—and surely a certain someone should have seen this coming—is a long list of names. Needless to say, Robinson is as readable here as he's ever been, and on very funny form. In any event, the last piece of the puzzle comes when Robinson's revelation of a narrator singles out Devi's daughter as the focus of its story. Having had a hard time meeting her mother's great expectations, Freya has finally left the nest when Ship's account properly kicks off. Determined to learn about the lives of others, she goes from biome to biome, speaking to people plainly, as is her way. In so doing, she learns of a growing sense of unrest with respect to the treatment of the people by their so-called superiors. Constrained as they are currently by "rules, strictures [and] prohibitions," (p,80) the working class crave the day when they'll finally be free: in other words, when the ship arrives at Aurora. But there, they encounter something that that casts their situation in sharp contrast. Them and Ship, that is, who in the process of telling Freya's tale learns a fair few things about itself. "Scribo ergo sum," (p.224) anyone? Freya, for her part, is a sympathetic central character whose struggle to fill her mother's huge shoes in the second act of Aurora paves the way for some fascinating complications. Of the others around her, there are those who leave a lasting impression—like Badim, Devi's sweetheart of a husband, Devi herself, and Jochi, whose isolated life is as long as it is lamentable—and those who don't. Here's looking at you, Euan. Aurora's characters may not be well-done to a one, but they are strong in sum—as is the narrative, which twists like a slinky in the middle and devastates as it descends towards its destination, though there are moments, in the meantime, when the story feels strangely straightforward. I haven't a harsh word to say about the setting, however. Balancing beauty and truth as they do, Robinson's futures are unlike any other author's, and his vision of the twenty-sixth century strikes a singular balance between the strictures of science and the incredible creations of the imagination. First, clearly metaphors have no empirical basis, and are often opaque, pointless, inane, inaccurate, deceptive, mendacious, and, in short, futile and stupid. Nevertheless, despite all that, human language is, in its most fundamental operation, a gigantic system of metaphors. Suffice it to say Ship favours analogies in its account afterwards. In this way Aurora itself develops, just as "in the process of making a narrative account of the voyage of the ship including all important particulars, creating in that effort a reasonably coherent if ever-evolving prose style, possibly adequate to serve when decompressed in the mind of the reader to convey a sense of the voyage in a somewhat accurate manner," (p.224) Ship eventually develops a sense of itself. 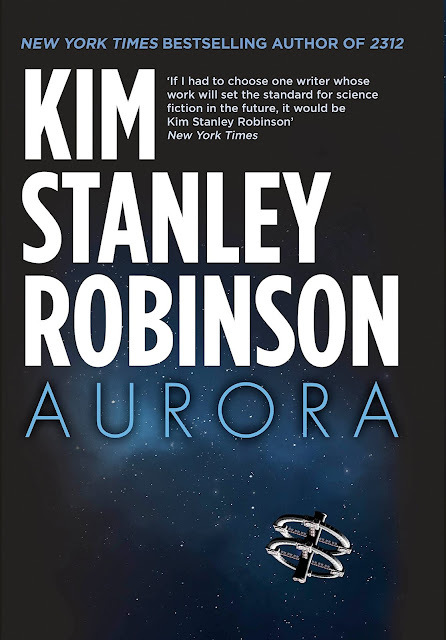 I won't go so far as to say that Aurora is Kim Stanley Robinson's most impressive effort since the mighty Mars trilogy—never forget 2312—but its setting is stellar, its characters and narrative never less than credible, and its depiction of the ascent of artificial intelligence must be among the most momentous takes on the topic science fiction has ever seen.